محمدیان, میلاد, مهدویان, عباس, قاسمپور, فاطمه. (1397). بررسی ومقایسه نتایج پارامتر ضریب بزرگنمایی خاک حاصل ازتحلیل دینامیکی خطی و غیر خطی. مجله ژئوفیزیک ایران, (), -. میلاد محمدیان; عباس مهدویان; فاطمه قاسمپور. "بررسی ومقایسه نتایج پارامتر ضریب بزرگنمایی خاک حاصل ازتحلیل دینامیکی خطی و غیر خطی". مجله ژئوفیزیک ایران, , , 1397, -. محمدیان, میلاد, مهدویان, عباس, قاسمپور, فاطمه. (1397). 'بررسی ومقایسه نتایج پارامتر ضریب بزرگنمایی خاک حاصل ازتحلیل دینامیکی خطی و غیر خطی', مجله ژئوفیزیک ایران, (), pp. -. محمدیان, میلاد, مهدویان, عباس, قاسمپور, فاطمه. بررسی ومقایسه نتایج پارامتر ضریب بزرگنمایی خاک حاصل ازتحلیل دینامیکی خطی و غیر خطی. مجله ژئوفیزیک ایران, 1397; (): -. مدارک مستند فراوانی بر اساس مطالعات دفتری و مشاهدات میدانی وجود دارد که نشان می دهند محیط خاکی زیرین سازه ها و پدیده اندرکنش خاک و سازه، در هنگام وقوع زلزله، نیروهای لرزه ای وارد به سازه را افزایش داده بطوری که این افزایش، در موا رد زیادی به خرابی و فروریزش سازه ها منجر شده است. پژوهش گران با مشاهدات عینی زلزله های گذشته، تجربیات و مدل سازی های انجام شده نشان می دهند که شدت و محتوای فرکانسی امواج زلزله که روی سطح زمین به ثبت می رسند تحت تأثیر رفتار غیرخطی خاک ساخت گاه قرار دارد. اطلاع از شدت و چگونگی این تأثیرات برای ارزیابی عمل کرد لرزه ای سازه ها و شریان های حیاتی ضروری است..ازاین رو دراین مقاله برای ارزیابی رفتارغیرخطی خاک آنالیزهای دینامیکی خطی معادل و غیرخطی درحوزۀ زمان برروی مدلهای یک بعدی ازلایۀخاک زیرسطحی انجام گرفته است ونتایج دو آنالیز با یکدیگرمقایسه شده است. 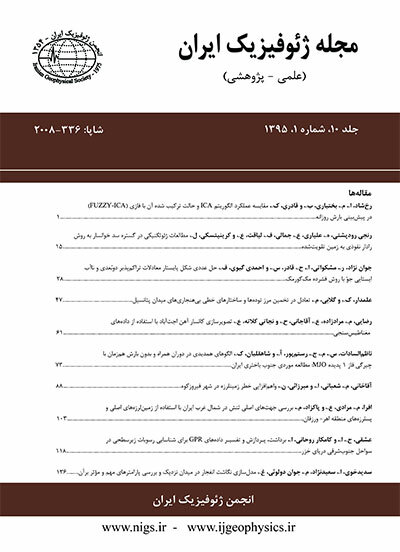 دراین آنالیزها از ۱۱ شتابنگاشت به عنوان حرکت ورودی برای آنالیزاستفاده شده است. سپس با مقایسه شتابهای طیفی درپریودهای مختلف سطح زمین بامقادیر متناظر روی سنگ بستر لرزه ای طیف بزرگنمایی شتاب طیفی درپریودهای مختلف ارائه شده است. نتایج نشان میدهدکه درپریودهای۰.۱ تا۱ ثانیه بیشترین مقداربزرگنمایی راداشته اند و بیشترین تفاوت مابین دوآنالیزوجود دارد. به علاوه مقدارضریب بزرگنمایی خاک براثر رخداد زلزله هایی بادوره بازگشت بزرگتر، به علت شدیدترشدن رفتارغیرخطی خاک،کمتراست واین بزرگنمایی ها در پریودهای بیشتری رخ می دهند. Iran country considered as very active region from seismicity. Averagely, in Iran, earthquakes with high Magnitude every year were happened. Therefore dynamic response analysis is one of important issues in evaluating of behavior of soil. Two method of dynamic analysis exist: equivalent linear method and nonlinear method. In this study, we used two boreholes data with depth 16 meter and 24 meter from Urmia city. Urmia city has experienced many large and moderate earthquake in the past years. Iranian standard 2800 recommended 0.25g for design base acceleration in this city. Some appropriate accelerometers were selected and scaling was made to matching designing spectrums. These accelerograms were scaled with same form spectrum but have different maximum acceleration (0.2g, 0.25g, 0.3g, 0.35g, 0.4g, 0.45g and 0.5g). Analysis were did by Deepsoil software and nonlinear and equivalent linear analysis spectra reported. Indeed, nonlinear method and equivalent linear method were compared. Overall, it could be concluded that differences between nonlinear method and equivalent linear method dependent on soil nonlinear behavior degree. In studying the seismic response analysis method of earth layers, deformation issues during earthquake are important. If magnitude of seismic movement is weak, shear strain of alluvium will be less than 10-4 percent and earth layer behavior will be elastic. For strains that are more than 10-4 percent, soil behavior will be nonlinear. For this state, nonlinear or equivalent linear methods must be used. In large shear strain that soli behavior is nonlinear completely; the problem must be solved at time domain and step by step. In current study, many accelerometers have been used for studying of Urmia bedrock. By using of these accelerometers and geotechnical boreholes, equivalent linear and nonlinear analysis will be done and achieved acceleration spectrums will be compared. Ground response can be analyzed with 1D, 2D and 3D modeling. These methods have different capabilities in terms of problem and wave geometry modeling, their synthesis to ground response modeling and also to solution of movement equations. Ground response analysis is usage for horizontal structures that boundaries between it owns layers are distinct, but in slope surfaces, nonlinear ground, heavy and rigid buried structures, walls and tunnels need 2D analysis and sometimes 3D analysis. In other words, while one of two soil profile dimensions (surface dimension and subsurface dimension) is much bigger than the other one, transmission synthesis is acceptable. Nonlinear behavior of soil can be modeled as equivalent linear or nonlinear mediums, by 1D, 2D or 3D methods. Equivalent linear method is popular between engineers, due to its relative simplicity and its simple and clear parameters. In the current study, the software of DEEPSOIL has been used to analyze the alluvium. Utilized software is based on direct and continuous solution of equation of transmitted waves, which calculates responses of a system with homogenous and viscoelastic layers against shear waves. DEEPSOIL is a one dimensional ground response analyzing which is able to examine the defined layers by both of linear and nonlinear analysis methods.